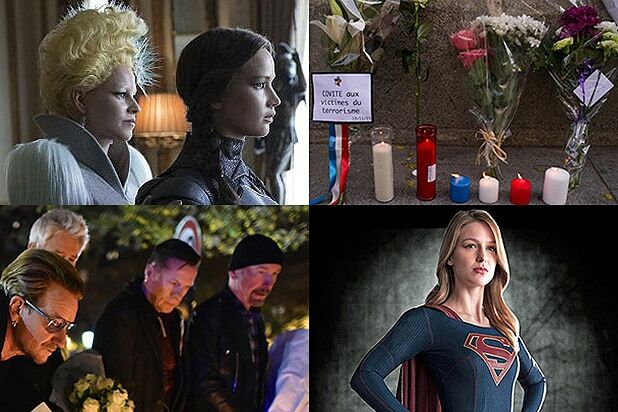 As the entertainment world scrambled to modify its plans following the tragic terror attacks in Paris, the industry responded Sunday with tributes to the victims, broadcast shifts and the cancellation of movie premieres and music concerts. Lionsgate announced it planned to scale down Monday’s Los Angeles premiere of “The Hunger Games: Mockingjay – Part 2” at LA Live. The finale in the “Hunger Games” series, which stars Jennifer Lawrence, Josh Hutcherson, Liam Hemsworth, and Elizabeth Banks was partially shot in Paris. There was no word from the studio about Wednesday’s New York premiere of the film, which opens nationwide Friday. Lionsgate wasn’t the only studio shifting its plans. Sunday’s Paris premiere of the Steven Spielberg-directed Tom Hanks spy saga “Bridge of Spies” was canceled by Twentieth Century Fox. And Vivendi-owned Mars Films pulled the plug on the Monday night Paris premiere of Natalie Portman‘s Western “Jane Got a Gun,” as well as the star’s planned press sessions and TV appearances in the wake of the attacks. On the TV side, CBS pulled terrorism-related episodes of “Supergirl” and “NCIS: Los Angeles” that had been scheduled to air in primetime on Monday night. The originally scheduled 10 p.m. episode of “NCIS: Los Angeles” focused on ISIS recruitment and will be swapped out for an episode titled “The Long Goodbye,” which sees the team searching for a missing colleague. The network replaced the scheduled 8 p.m. episode of “Supergirl,” which dealt with bombings throughout National City, with a Thanksgiving-themed episode. 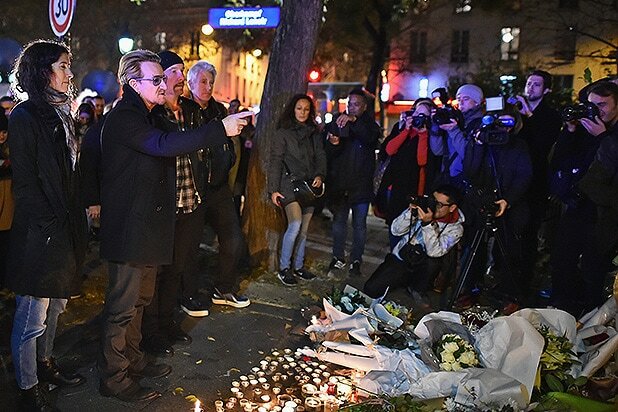 The music industry took the tragedy particularly hard and reacted swiftly, in part because one of the attacks occurred at the Bataclan concert hall, where California band Eagles of Death Metal was playing. The group’s merchandise manager was among those who lost their lives. The Foo Fighters canceled the remaining dates of their Sonic Highways World tour, including a concert in Paris, and rock band U2 scrapped performances scheduled for Saturday and Sunday night in the City of Lights. The Saturday night show was to have aired as an HBO TV special. Instead the group visited a memorial to the victims outside the Bataclan. “If you think about it, the majority of victims last night are music fans. This is the first direct hit on music that we’ve had in this so-called War on Terror,” U2 frontman Bono said Saturday in a radio interview, as reported by Rolling Stone. 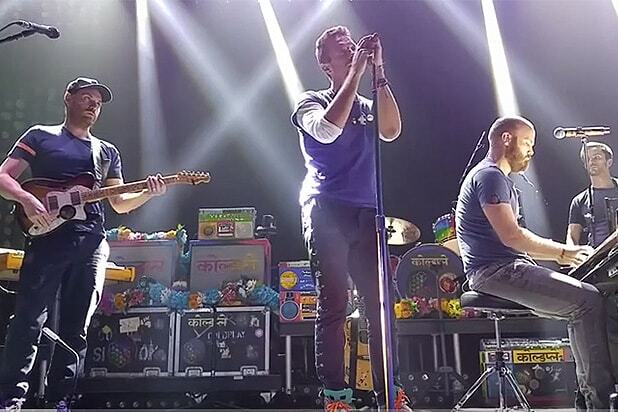 In Los Angeles, rock band Coldplay was working to set up a new date and location for a show, after the group’s Friday night performance at the Belasco Theater was cut short in the wake of the attacks. Plans to stream the show live on Jay Z’s Tidal service were scrapped, though the group performed an abbreviated set for the fans who had already arrived. Across town, Cheryl Boone Isaacs, president of the Academy of Motion Picture Arts and Sciences, issued a ringing call for solidarity with France during the Governors Awards on Saturday. NBC’s sketch comedy series “Saturday Night Live” replaced its traditional cold opening with a message to the citizens of Paris. “Paris is the City of Light, and here in New York City, we know that light will never go out,” cast member Cecily Strong said while standing on stage in Rockefeller Center’s Studio 8H, facing the camera. “Our love and support is with everyone there tonight. We stand with you.” Strong then repeated the same emotional message in French. 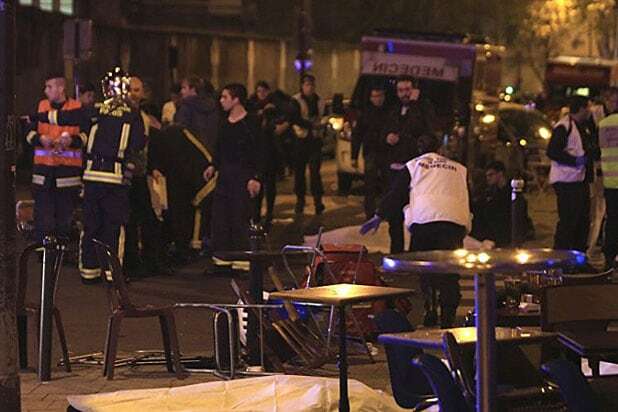 Friday’s terrorist attacks in Paris killed 129 and injured 352 others, with ISIS claiming responsibility hours later. France responded by bombing a series of ISIS sites in Raqqa, Syria, on Sunday including a jihadi training camp and a munitions site where intelligence officials said the Paris attacks were planned, the Associated Press reported. Additionally, police announced seven arrests. However more members of the sleeper cell that carried out the attacks were still believed to be at large. French police respond to terrorist attacks in multiple locations across the city. As many as 60 deaths were reported following the attacks in Paris. Police line the streets of Paris following multiple attacks. Emergency personnel responding to Paris attacks. A police officer outside a Paris restaurant. Fans in Stade de France, the site of one of the bombings. President Obama delivers speech pledging to support French government. Police survey the area of Boulevard Baumarchais.